When all the birds are on the wing. Isn’t that the silliest thing you’ve ever heard? I thought the wing was on the bird! That little ditty appealed to my early grade school sensibilities when I learned it. But each year, unbidden, it rises to my consciousness when the days start getting longer. Signs are everywhere: green tips are pushing from the earth, cats are shedding, my nails are growing faster. 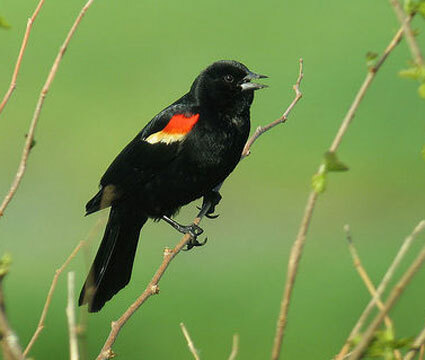 But nothing says spring more clearly to me than the trill of the red-winged blackbird. Although it happens annually, it’s always a surprise when that first “chip, chip” registers in my dormant winter brain. I keep walking past the cattails until I finally am aware, stop myself and say, “They’re here, it’s spring!” while their red epaulettes flash in the sun. Now, each spring, when I hear that raucous call of the blackbird, I am transported to those days and that cat and it makes me smile. I’m sure, for others, it’s a different cue. What is it that says springs loud and clear to you?